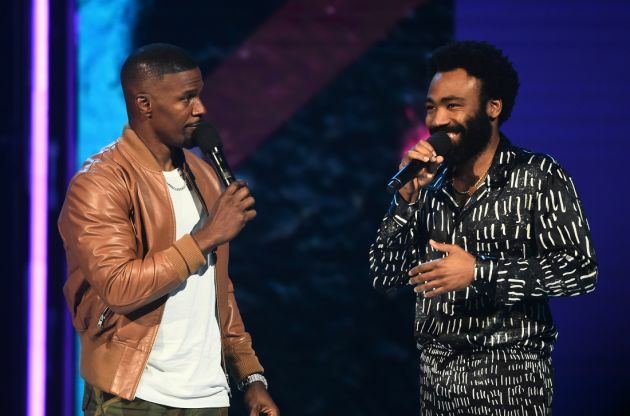 After praising the Atlanta actor, Foxx jokingly did his own interpretation of the dancing from Childish Gambino’s (Glover’s hip hop alter ego) “This Is America” music video helmed by Glover’s frequent collaborator and director Hiro Murai. From there, to the crowd’s delight, the two started singing an a cappella version of the song. The performance was totally off-script as Glover was surprised to go up on stage. After singing a couple of lines from the hit song, he gave a quick shout out to Emmy-winning writer and The Chi creator Lena Waithe and Insecure‘s Issa Rae.